The video above shows a white blood cell following and then eliminating a Staphylococcus aureus. Notice how relentless the white blood cell is until it captures the “prey”. It’s hard to believe that when we feel under the weather with colds and flus, this very action takes place in our bodies. As we sip chicken soup and boost stock for Kleenex, our white blood cells are on the hunt, searching to seek and destroy trespassers found within the human body. Humans are a marvel, aren’t they? 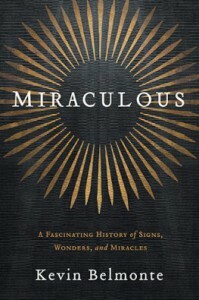 In Kevin Belmonte’s new release, Miraculous, he shows us a long chronology of God’s power to perform miracles. He starts with Creation (that includes us) and moves swiftly yet comprehensively through the Bible and throughout history. 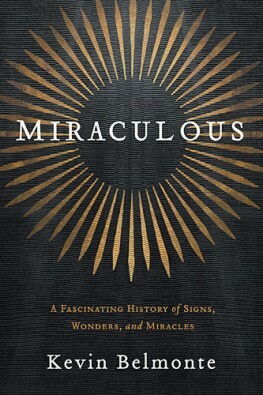 His book ends with Kevin’s own encounter with miracles, citing a storm which should have destroyed his home and the birth of his son Sam. Kevin is a writer of both natural talent and prodigious knowledge. He holds a BA in English Literature and two Master’s degrees: one in Church History and the other in American and New England Studies. Kevin has written biographies on Christian monoliths such as G.K. Chesterton and William Wilberforce. In fact, you may remember a film titled Amazing Grace which chronicled Wilberforce’s effort to abolish slavery in England. Kevin was the lead historical and script consultant for the film. After Kevin explains the myriad of Biblical miracles, he transitions easily into more contemporary figures. Here he outlines the stories of great servants such as Perpetua, Augustine, Julian of Norwich, Martin Luther, Gilbert Burnet, Jonathan Edwards, David Hume, George Washington, William Wilberforce, D.L. Moody, Joy Lewis, Corrie Ten Boom, and Clyde Kilby. What I especially enjoyed was Kevin’s engagement with apologetics. Some authors would shy away from this, fearing that they would confuse the reader, but Kevin marches boldly into the temples of misunderstanding and cites several admired authors about the importance of God’s intervention in our world. A miracle is, as Hume termed it, “a transgression of a law of nature” by a Deity who created nature. Surely, He who created the world can thwart His own preset laws to illustrate His power. Kevin continues by using William Paley’s famous argument “the watchmaker metaphor”. Here, Paley argues that if “I pitched my foot against a stone”, he would most likely conclude that the stone has always been there. Yet, if he found a watch on the ground, he would immediately assume it had a different origin. In fact, the watch requires “a maker…an artificer…who formed it.” Therefore, not all random cosmic events in the universe are a product of circumstance. Something (a Deity) can certainly create and introduce organisms (or watches or what have you) into existence. God can and does intercede at many moments throughout history, as Kevin outlines in this masterful work. Miracles are occurring all around us, all the time. Most of the time, we neglect or ignore them, opting to side with “reason”. But if we do so, and we understand the patterns at work around us, we will arrive at a moment where we cannot explain what has happened. By all accounts, A should have happened, but B happened instead. Logic dictates that A should have taken place, so what do we make of this? In our world, we have termed it “luck” and most people are comfortable using the term when explaining a supernatural interference. This is illogical. One cannot negate the idea of God and His intervention by simply calling it “luck” and then complain that there is not empirical proof of God’s existence. Can you tell me why A didn’t happen? If you truly cannot, then you also cannot elminate God from the equation. In addition, Kevin reminds us that miracles are weaved in and out of our personal journeys. In a chapter about the silent film King of Kings (released in 1927), Kevin narrates a story in which a Polish man named William Wallner is enraptured by the scenes of Jesus. During the 1930s, Wallner becomes the leader of a Lutheran parish in Prague. A doctor in Wallner’s parish was later arrested and taken to a Nazi concentration camp. While there, the doctor continued to share his faith, to the disdain of the Nazi officers. He was struck with an iron rod until one of his arms was amputated. When this did not deter the converted physician from sharing the Good News, an officer beat his head against a stone. The officer told him that he “look[ed] like your Jewish Christ” to which the doctor replied, “Lord never in my life have I received such honor – to resemble You” (233). The German officer could not shake these words from his conscience. Later, the officer found Wallner and came to know Christ. The officer returned to the concentration camp and risked his life to collaborate with Wallner and the Czech underground to save many more Jews from death in the camps. Even through such darkness, God made a miracle occur. To bring us to the present, Kevin interviews pastor Mark Rivera and scholar/poet Dr. Holly Ordway. Pastor Rivera recalls a prayer which saved his brother from dying after receiving several gunshot wounds. Dr. Ordway was a staunch atheist who came to know Christ through reading poetry and discussing faith with her fencing coach. Dr. Ordway recalls a dream in which she and her coach are in Jerusalem, near the empty tomb of Christ. When she awoke, all of her reluctance melted away and was replaced with joy. In true Old Testament fashion, God used a dream to bring Dr. Ordway to a poignant realization. Dr. Ordway is now employed at Houston Baptist University where she is an instructor in the Cultural Apologetics Master’s program. Her journey to faith is chronicled in Not God’s Type: A Rational Academic Finds a Radical Faith. You can also read insights on her blog Heiropraxis – http://www.hieropraxis.com/. When I finished Kevin’s book, I felt that I had been on a great journey. This journey makes us examine the enigmas in our world, and more importantly, it makes us marvel at the Author of the universe. Miracles are happening all around us. If you are seeking a miracle, visit the nearest mirror and take a good look. Notice the complex design of the eyes which peer back at you. Slightly turn your head and observe the dense network of muscles employed in your face when you laugh, or cry, or are perplexed. Your body is evidence that a God exists and that He is still in the business of performing miracles to this very day. Kevin Belmonte, as a faithful guide does, leads us into a richer understanding of our God and a renewed awe at His handiwork. I highly recommend you read and cherish this work.